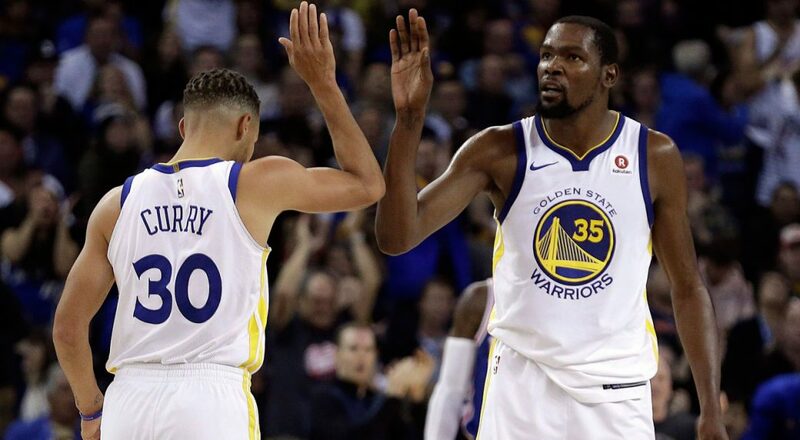 The Golden State Warriors beat the New York Knicks 122-95 in the regular season home game of the NBA 2018-19 at the Oracle Arena in Oakland, California. The Golden State (27-14), with two consecutive wins, kept second place behind the Western Conference No. 1 Denver Nuggets (27-12) one game behind. New York (10-11) was the 14th Eastern Conference winner. Thompson shot a 43-point lead with seven 3-pointers. Durant helped the team win 24 points, 6 rebounds and 6 assists. Curry scored 14 points, seven rebounds and 14 assists for double-double. Curry scored 2,280 shots in three consecutive games, chasing Jason Terry (2,282, retired), third in the history, to his chin. Curry was able to achieve third place in history. However, he focused on the role of 'helper'. His teammate klay Thompson gave him a good shot and drove him to the outside. It is not the first time Curry has been a helper of Thompson this season. He threw a shot at the Chicago Bulls on October 30 last year when Thompson showed off his accurate shot. Thompson then scored 14 points in his three-pointers, exceeding his previous three-point total of 13 games. In New York, Tim Hardaway Jr. (13 points) and Enes Kanter (12 points, 16 rebounds) were unable to survive the third quarter. Golden State's long-term "promise of the third quarter" came out. New York had a good fight against Golden State by 59-61 in the first half. But the third quarter collapsed. Durant and Thompson were in the center of the "third quarter" of the promise. The two players combined 26 points including three 3-point shots in the third quarter only. New York was higher than the three-point total (19 points). New York was frozen at 27.3 percent in the third quarter. As a result of the difficulty of the attack as well as the defense, the score car became big in the blink of an eye. Golden State did not care about the fourth quarter. He ran away, but he did not pull out the main players and spread the gap further. Thompson's three-point wedge in virtually the victory came in, and then he brought the players to the bench and prepared for the next game.